This mob spawns at -1335.65, -57.47, 8.32. Not on progression servers as of Luclin. This page last modified 2017-01-02 19:33:59. 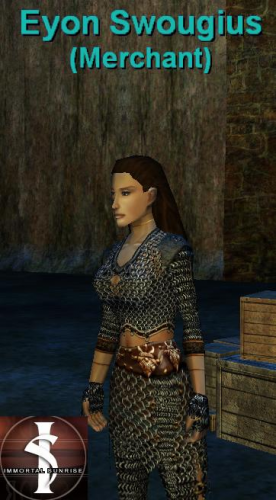 Eyon Swougius is just West of the North Ro gate part of a group of 3 merchants that sell spells, she's the middle one. Is She on Progression Servers - Fippy & Vulak'Aerr - (Yet)? Has anyone been able to find here for the spells listed that mages need (less than level 50 spells) on the Time Progression Servers, Fippy and Vulak'Aerr? I have tried and most of the NPC's listed on the in game maps I have are not up. Beorwulf's directions worked for me, after a little confusion caused by my own impatience. Just follow them carefully, don't just scan them. 1. START at the DESERT of RO zone IN East Freeport. You should be standing at her feet. FIND Eyon Swougius the easyway! Go to East Freeport use the find function look for the Town cryer named Lindie Rains follow the yellow path to her then go southwest a little bit and you will see 3 merchants Eyon Swougius is the one in the middle. I was looking for this merchant in Freeport today and doesn't show up using Find in either side of the city. I was wrong (if you saw my first post) sorry about that. will probably not be there till luclin or later..
n1335, n64, p8 is her loc. She is near the Desert of Ro zone. My previous post failed to mention I'm on a progression server. This vendor does not exist yet as of Kunark expansion. However, to correct the above the ns loc is -1335 and she is very close to n ro zone by some crates. her location is approx. 1340.08, -56.47, 8.32. Hope this helps! This loc does not exist...please be more specific. does not exist on progression servers yet.. I went to East Freeport to look for this guy and he was nowhere to be found. Does anyone have a location on where he is supposed to be?